View of the Great Smoky Mountains from near the top of Cherohala Skyway. 2008 – Too sleepy and too cold! 2015 – Successful everesting of Clingman’s Dome! 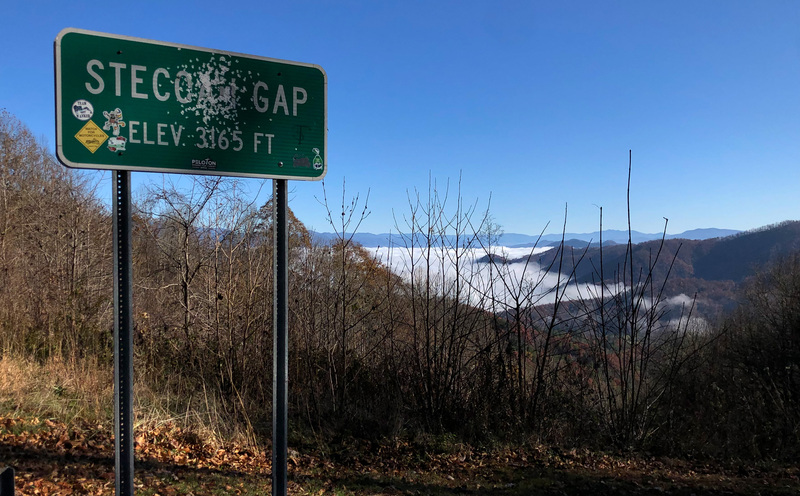 2018 – 416 miles and nearly 37,000 feet of climbing riding from Gatlinburg, Tennessee all the way back home to Hoover, Alabama. I wanted to get home to Birmingham relatively early on Sunday so I wanted to get as early a start as possible Saturday morning so I could get to the hotel in Chattanooga early and then leave again early Sunday morning. I woke up at 2:45AM even before my alarm went off (set for 3AM) so I was up, dressed, and ready to go shortly after 3AM. I left Gatlinburg with temps in the low 30s knowing that I would be fine for the first couple hours of the ride on the 25 mile climb up to the top of Clingman’s Dome. My only concern was whether the sleet, snow, and rain from a couple days earlier would have dried out completely or left slippery roads. There were a few wet spots, and a few icy spots, but no ice completely covering any of the road so I could always find a clear path up. The temp did drop down into the mid 20s around Alum Cave, the coldest part of the climb, before rising again to 30-32 degF by the top of the mountain. It was still 30+ minutes before sunrise when I made it to the top as I took a couple photos looking towards Gatlinburg and Pigeon Forge that looked like middle of the night photos. But turning east, you could just barely make out some red in the sky hinting at the coming sunrise. I was concerned about how cold the descent down into Cherokee would be. I knew that the temps were supposed to get up into the upper 50s so I had opted for a longsleeve rain vest and knee warmers as my cold weather clothing. I also brought chemical warmers for my hands and feet. This turned out to be the perfect combination to deal with the cold temps without having to lug a ton of clothing around with me. It was very cold in the massive Cherokee/Bryson City valley with all the cold air settling down in the valley. I stopped at Hardee’s for breakfast and to warm up with coffee. With a couple large lakes (Fontana and Santeetlah), there was quite a bit of fog in the valley. Getting started again was very cold, but it was also very scenic along the Oconaluftee River outside Cherokee and following the rivers all the way over through Bryson City. 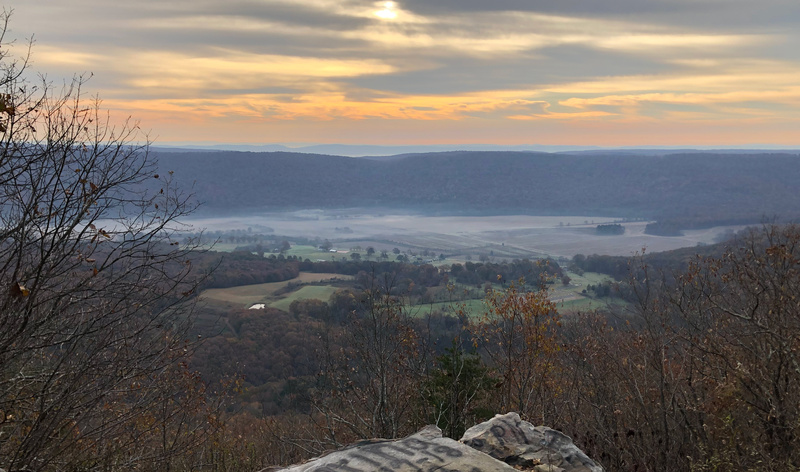 It wasn’t until I made it about halfway up the Stecoah Gap climb outside Robbinsville before I climbed out of the fog. It was still pretty cold, though, on the descent down into Robbinsville. It wasn’t until halfway up the climb to the start of the Cherohala Skyway climb that I was hot enough to strip down to shorts and shortsleeves for the rest of the long climb. This was tricky because a lot of it was in the sun, but every time there was a sheltered section still in the shade it was quite cold, even with the effort from climbing. Fontana Lake underneath the fog viewed from Stecoah Gap. I have never ridden on Cherohala Skyway, but I’ve heard about a popular cycling event held there every year which I’ve never been able to attend. Also, it is very popular with motorcycles because of its proximity to the Dragon’s Tail on US Hwy 129. I saw slide-out barriers underneath the guardrails to protect motorcyclists who crash on several of the turns. The climb itself was pretty steady and steep, unlike the descent which was quite undulating. In fact, there were several larger 100-200 foot climbs on the descent that made it a particularly tough one – especially, since I had long ago run out of food and was bonking pretty bad. The pic at the top of this post is a view looking back down at a different section of the Skyway from higher up on the Skyway. Also, it is looking back in the general direction of Clingman’s Dome and the rest of the Smokies, but it is hard to tell from this angle which mountain is which. Everything from Cherohala to Chattanooga was new to me. Even though I had planned several routes through the area over the years, I had never been able to do those rides. 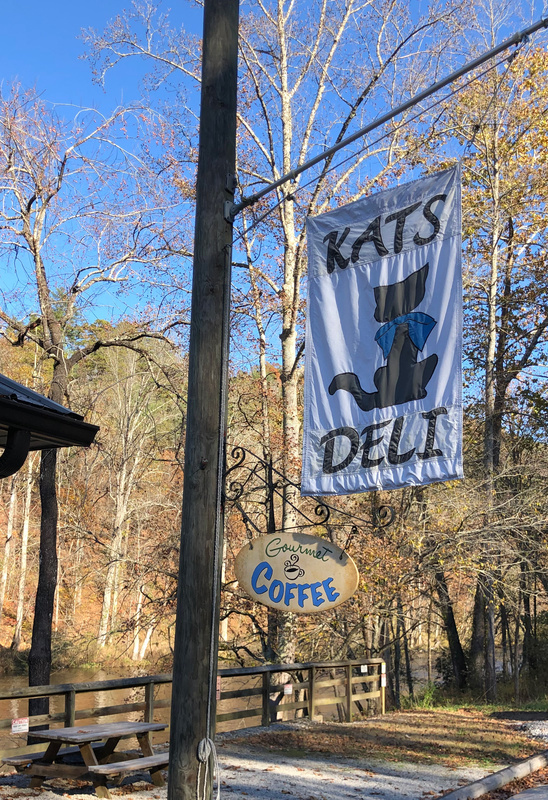 I stopped at Kat’s Deli at the bottom of the Cherohala descent, which was an awesome place to get food (I had been out of food for a really long time). This cool deli had a seating area overlooking the Tellico River. They also had a cool laminated map of the Appalachian Trail extending from Maine all the way to Georgia. I opted for the inside table and their special of the day – a really good panini. Since the deli also was part grocery store, I stocked up on enough food to get me the rest of the way to Chattanooga. Kat’s Deli at the bottom of the Cherohala Skyway. Leaving the deli on TN-165, I noticed an increase in traffic but it wasn’t terrible. I also said good-bye to the mountain rivers as I started to roll up and down over the hills quite a bit more. I turned onto TN-39 and followed it to Mecca where the road turned to TN-310 taking me into Etowah. This was the first sizeable town I had seen since Robbinsville before Cherohala. I took back roads out of town, and eventually wound my way over to Calhoun where I hopped on US Hwy 11 taking it all the way down to Cleveland. This stretch of highway was quite busy, but there was a small stretch of shoulder on the outside of the rumble strip. There would be debris (branches) or surplus of gravel every now and then so you had to play the dodge the debris and rumble strip and traffic game, which did not make for pleasant riding, but it was bearable. Thankfully, this section didn’t last long because the road widened to two lanes each direction as I got closer to Cleveland and then eventually included a nice bike lane. A nice couple rolled up beside me at one of the traffic lights going through Cleveland and asked where I was going and I told them Birmingham, but I was spending the night in Chattanooga. Even with the busy stretches of road I didn’t have any problems with angry honking or people swearing at me to get off the road. Leaving Cleveland, I hit an unexpected rumble strip as it had suddenly restarted again on the outskirts of town. I was going fast, and so the sudden jolt hurt my toe quite a bit as it caused sudden movement. This was the start of the worst section of road. It was nice with two lanes each way and a wide rideable shoulder for a few miles, but after Hwy 11 merged with US Hwy 64 and crossed under I-75 the road got smaller with only one lane each way. This stretch of highway was crossing several ridges and small hills heading west across the topography which slants Northeast to Southwest. So I was concerned with the high speed traffic and the hills. I had my Garmin Varia to let me know when cars were approaching, but I would still look back and assess the approaching car while riding on the rightside of the lane. Once the car made it halfway up the Garmin screen I would hop the rumble strip or time the regular gaps between the rumble strip which thankfully is how they do rumble strips in Tennessee – unlike Alabama and Mississippi which both have continuous rumble strips sometimes taking up the entire shoulder. It was dark by this point, and traffic just kept getting busier as I got closer to Chattanooga. I ended up altering my route on the fly to try to both shorten the distance to the hotel (I was tired) and figure out a safer route. I accomplished both by hitting the frontage road along I-75. There was surprisingly little traffic through here although the road was in pretty bad shape in several places, and I hit a pothole at some point that I was very lucky didn’t cause a double flat. I rolled up to Fazoli’s at Hamilton Place around 7PM and ordered dinner to go so I could eat in my hotel. When I checked in at the Holiday Inn, they were having a special promotion where you could spin a wheel with prizes. I won dinner for two at the hotel restaurant. Since I had just bought dinner at Fazoli’s, I exchanged that for a free item from the hotel sundry/snack area. Not a great deal, but I didn’t have a drink and was able to get a coke for free out of this. Shower, dinner, and straight to bed with my alarm set for 3AM. 3AM came awfully early, so I ended up snoozing my alarm and didn’t get out the hotel door until closer to 3:45AM. It was cold and quite foggy as I left the hotel. Very little traffic on a Sunday morning, though, as I wound my way over to the Tennessee River and downtown Chattanooga. Before reaching the river, though, I came upon and went through an unexpected tunnel I didn’t realize was on my route. 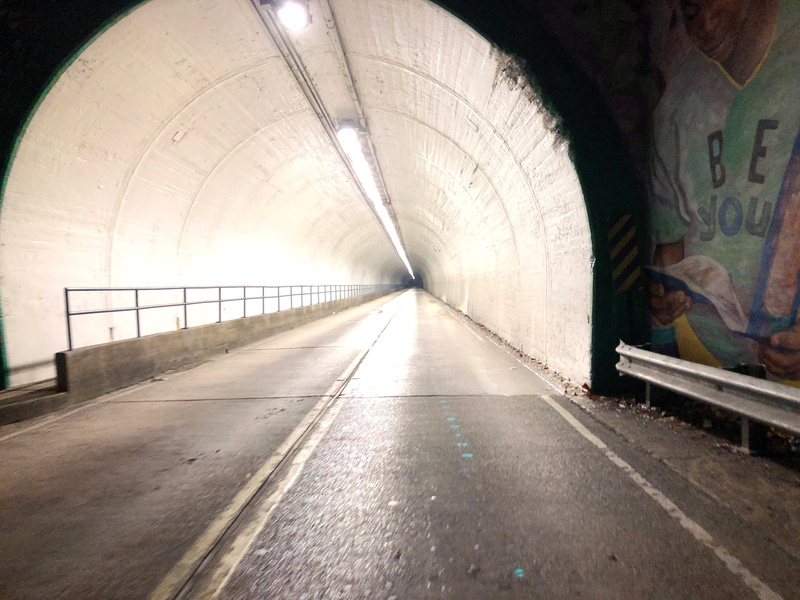 An unexpected tunnel near the Tennessee River in Chattanooga. Be you. After the tunnel, I dropped down to the river and followed one of the river trails all the way to the art district where I dropped down again and crossed the river on the downtown pedestrian bridge, which I have walked across a couple times but never ridden across. Now I have ridden across it … twice! I turned around on the far side and rode right back across it again to get back onto my route to take me up Lookout Mountain. With the heavy fog and temps near freezing I wanted to get out of downtown as quickly as possible hoping that it would not be foggy on top of the mountain and hopefully much warmer too. I was right on both accounts as temps rose to near 40 degF by the time I reached Point Park. The fog had lifted even earlier, shortly before the Ruby Falls parking area and entrance. 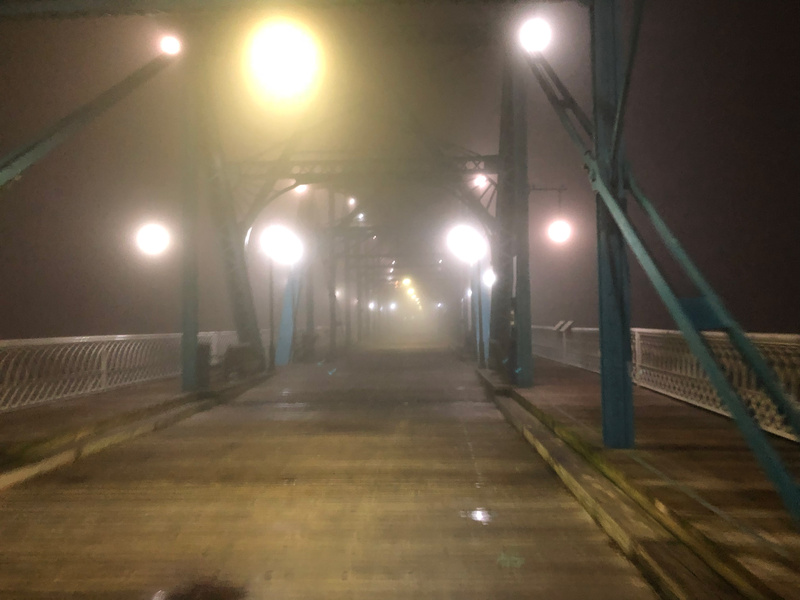 I crossed this tall pedestrian bridge across the Tennessee River in downtown Chattanooga. Once I got rolling across the top of the mountain, I put my long sleeve vest back on because it was getting chilly. This was also in preparation for the descent off Burkhalter Gap back down into the very cold foggy valley of Trenton not too far from Valley Head, Alabama which is frequently the coldest place in Alabama. The descent was fast, and I knew I would only be in the valley for a mile or two before climbing back up again into warmer temps. I climbed up and out of the fog and into a beautiful sunrise. I worked my way past Mentone, through Desoto Falls State Park, and across the top of the mountain to the entrance of Little River Canyon. The road that skirts the edge of the canyon is like a hot wheels track for bikes. Ups and downs, twists and turns, with so many scenic views. The rain from a couple days prior had left all the streams and creeks flowing into the canyon raging with water falls big or small at just about every creek crossing. Grace Falls, the highest waterfall in Alabama, was flowing spectacularly. This waterfall drops 133 feet into one of the spurs at the edge of the canyon, but it has always been dried up or flowing so slowly that you can’t see it from across the spur. So I was happy to see this waterfall for the first time. It also helped that I was riding the canyon rim in the reverse direction that I normally ride it because the scenic overlook for this waterfall is on a somewhat steep uphill making it easy to pull over and stop and look — as opposed to flying down the other way not wanting to stop and lose all that momentum. Following the canyon rim on mostly deserted roads, I marveled at the sheer drops and steep hills. Especially, the hills within hills as shown below! One particularly steep cement drop off had me worried because I’ve only climbed it at slow speeds. This time I would be going down that drop, so I wasn’t sure how rough it would be. 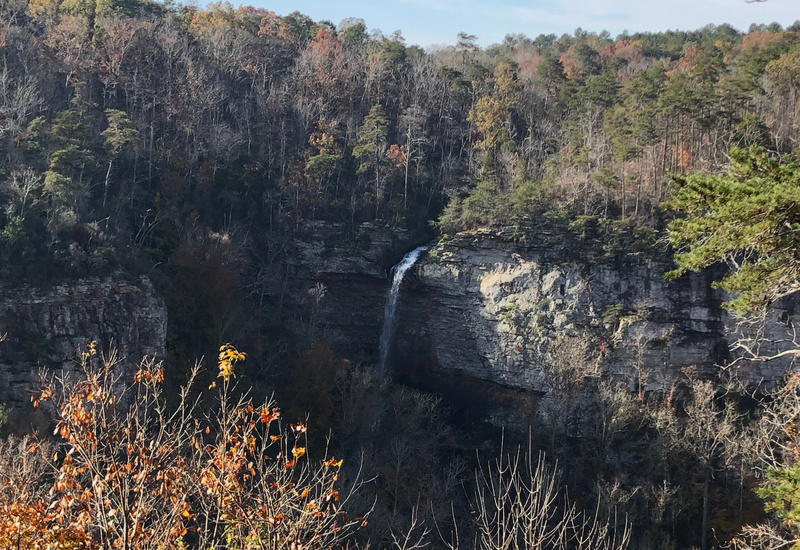 Grace Falls, with its 133 foot drop into a canyon spur, is the highest waterfall in Alabama. Little River Canyon wide and deep spot. Hills within hills … downhills even on a steep climb!!! 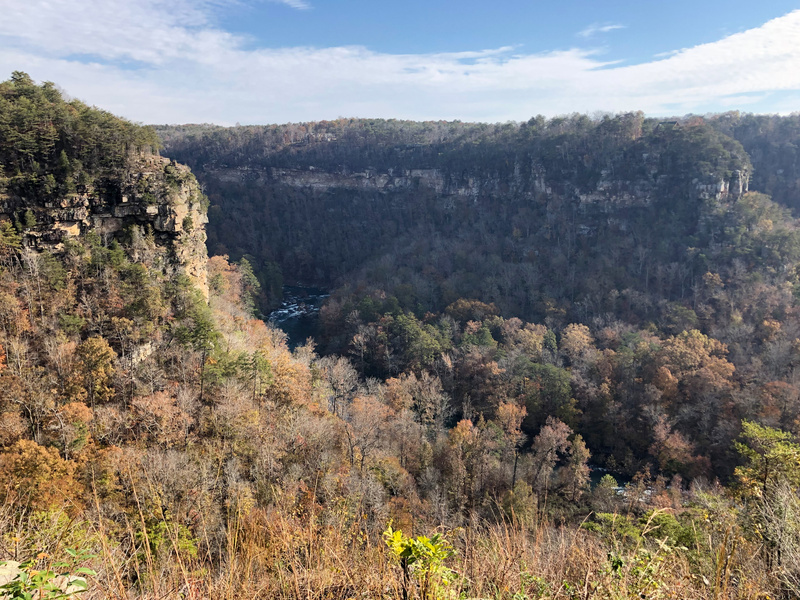 At the end of the Little River Canyon is an extremely steep 20+% drop down to a national scenic area called “Mouth of the Canyon”. Here the “Little River” empties out into the giant Coosa River valley which defines a huge strip of Alabama from the Georgia border down past Gadsden to Pell City. 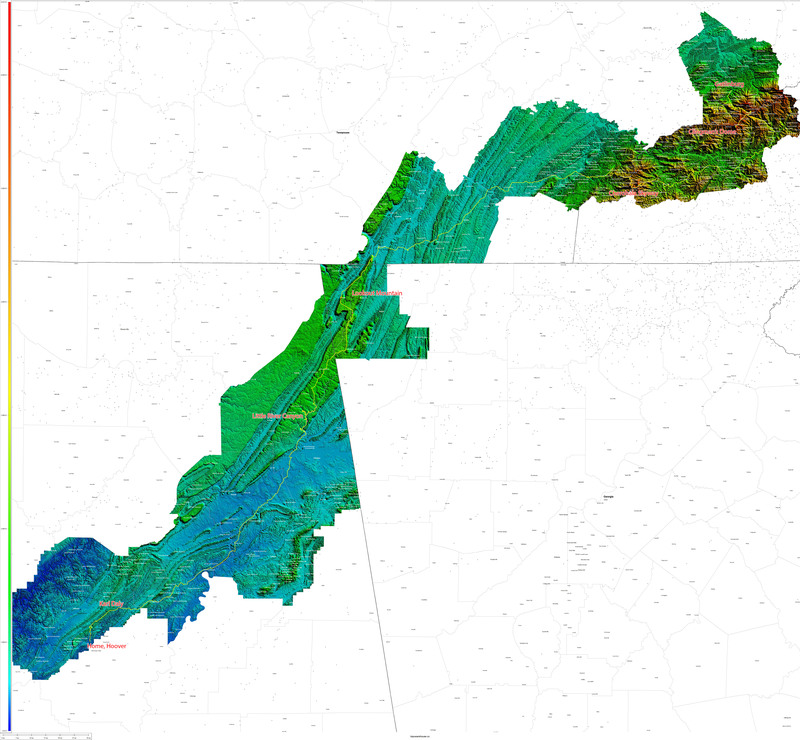 Below Pell City, the valley shrinks a bit and the hills get hillier and bluffier. 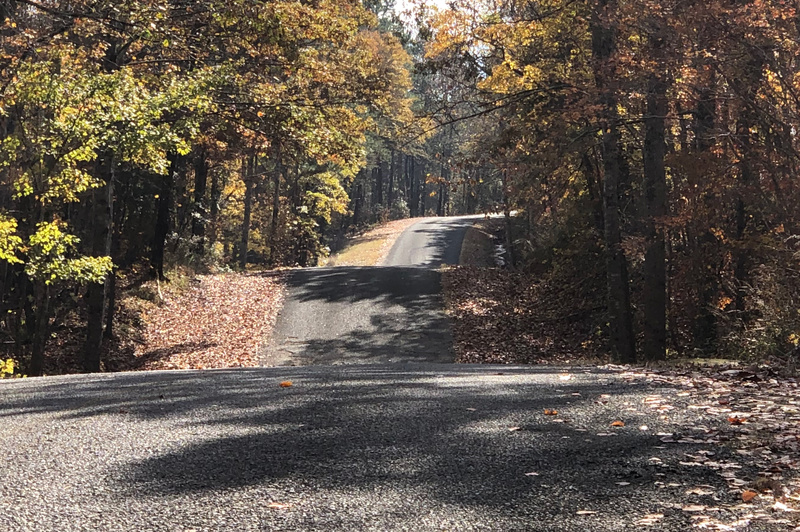 I enjoyed the fast riding on relatively flat roads until I got past Hokes Bluff and Glencoe where the Sunday afternoon traffic really picked up on Green Valley Rd. Eventually I made it over to Hwy 77 thankful for a shoulder to ride on again. One of the biggest road surprises for me was shortly after crossing the Coosa River on top of the Neely Dam. I was greeted by a brand new road parallel to AL-144 that used to be pretty rough chip seal. Now it was perfect tarmac helping cut out a few miles of the ride by bypassing Ragland, and also cutting out so much traffic. By this point I was back to quite familiar roads, and worked my way over to Hwy 78 making my way through Pell City and Leeds. The second to last big climb of the day was Karl Daly, a nice long steady climb outside Irondale. This was the first climb that I was able to successfully everest, having failed a couple weeks earlier in 2014 attempting to everest Clingman’s Dome the day after the 2014 ACM conference in Gatlinburg. It was special to include this climb on my route, as I also included Clingman’s Dome which I successfully everested in 2015. The ride wasn’t done yet, though, as I had scheduled a meeting at Brookwood Mall with a Pokemon friend (named “Ever”!) to do a trade. After the trade my light died, but when I went to switch to my backup light it was broken (flickering with low light even though the battery was full). I had a long climb up to the top of Vestavia Dr, so I plugged my dead light into my battery pack and after the 20 minute climb in the dark to the top of the hill I had charged the light enough to make it down the mountain on the other side to my house … There’s something nice about ending 416 miles by opening the door to the basement and parking my bike the same place I park it after any of my normal daily commutes to/from work. Ride home from Gatlinburg? 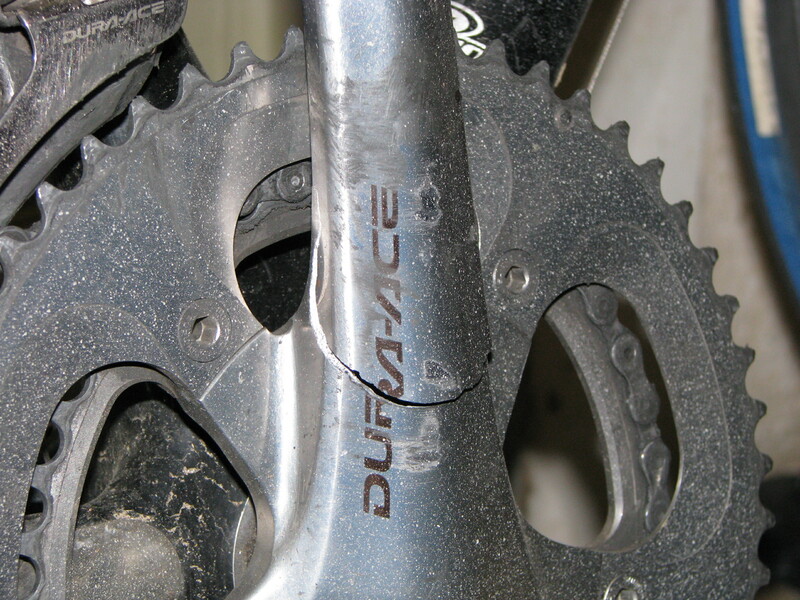 Sure, no problem, just another daily adventure on the bike! This entry was posted in Adventure, Training and tagged climbing, mountains, p2p, smokies on November 26, 2018 by kartoone.